Rotary Unions for Rotating Spindle | Advanced Machine & Engineering Co.
A rotary union is a mechanical element which transfers liquid or gaseous media from a stationary part to a rotating one. With rotary unions from OTT-JAKOB, various types of media can flow through the spindle. Our range of products includes single- and multi-passage rotary unions designed for use with hydraulics, air, coolant, MQL, internal spindle cooling and cryogenic machining. 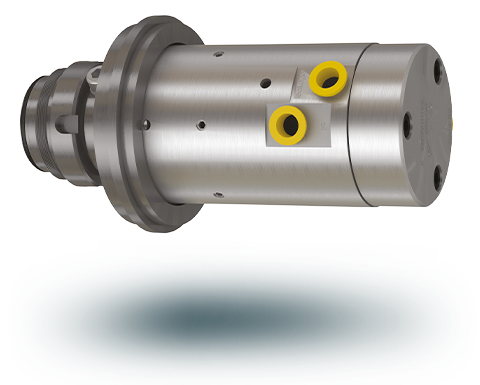 The single-passage oil rotary union is screwed directly onto the spindle shaft and is a cheaper alternative to the hydraulic release of clamping systems. 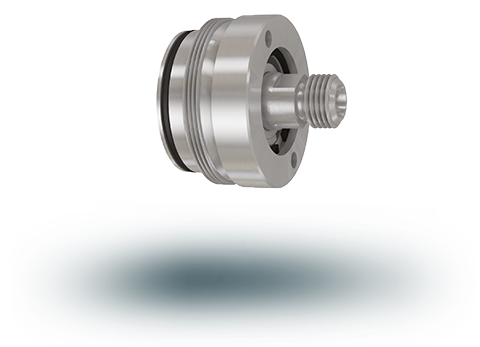 With our dual-passage rotary unions, you can supply hydraulic oil to release the clamping system through one passage whilst feeding another medium through the second passage. It is attached to the spindle shaft. Depending on the media required, various configurations of our dual-passage rotary unions are available (see specifications below). Single-passage GD and single-passage GDP rotary unions feature permanently closed sealing surfaces. The unique seal is compatible with all conventional media and even allows for unlimited dry machining, reducing leakage to a minimum. The high-quality built-in hybrid bearings have low coefficients of friction and a longer grease service life, allowing them to guarantee long-term functionality at high speeds. A labyrinth seal effectively protects the bearing against contamination, helping to maximise its life span. The coolant connection can be rotated up to 360° to make it easier to install. All GD rotary unions are available with radial and axial connections. Maintenance cycles can be calculated, which ensures optimal availability. 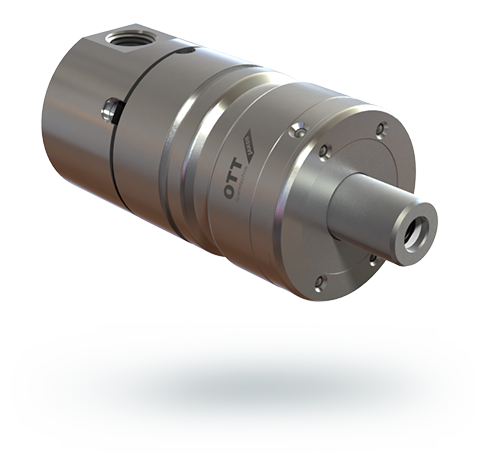 GD rotary unions are attached to OTT-JAKOB unclamping units. The installation diameter of 48 mm (GDP 32 mm) defined by OTT-JAKOB remains the standard in the industry to this day. Contact us to find the optimal solution for your applications! To ensure optimal functionality in the long term, our service department can repair worn and defective rotary unions. Our skilled technicians can restore your rotary union in line with OTT-JAKOB’s high quality standards. Repaired rotary unions are subject to the same warranty as new parts.